This is a new feature to help streamline grower application process for the NSW drought transport subsidy. The feature introduces the ability to auto-generate freight disclosures on invoices in addition to a new RRA freight subsidy report built into the platform. READ ON to find out more about how AgriDigital makes freight rebate applications simpler and easier! Details of the NSW drought relief package are available at the NSW Rural Assistance Authority and at the Department of Primary Industries websites. 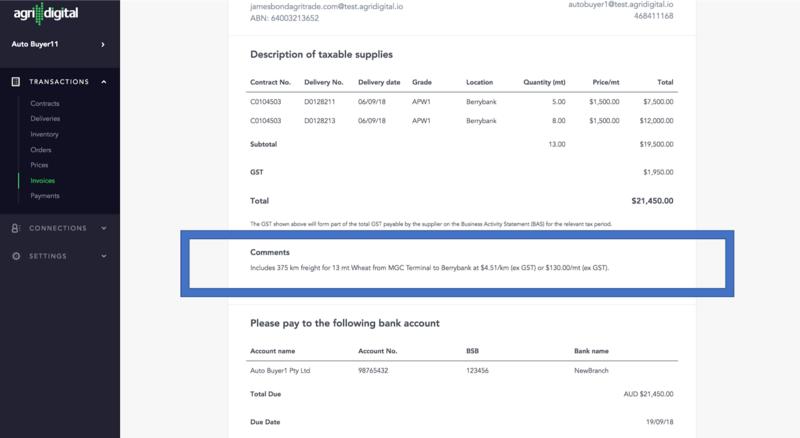 To assist in the application for the rebate as a grower purchasing fodder from an AgriDigital subscriber, growers can now get in touch with the seller and request that they include a freight disclosure notice on sales tax invoices using the built-in automated feature within the platform. NOTE: It’s important to let the seller know you will be claiming the rebate at the time you order the deliveries to ensure the disclosure is included on the invoice when it arrives. NOTE: For Contract to Contract order types, the freight disclosure notice can be controlled independently at the origin and destination ends of the order to the user control of the freight disclosure notice at a contract level. What’s included in the freight disclosure on the invoice? The freight disclosure on an invoice provides a summary of the freight movements that have been included in the invoice. The following is an example freight disclosure: "Includes 375 km freight for 13 mt wheat from MGC Terminal to Berrybank at $4.51/km (ex GST) or $130.00/mt (ex GST)." The report includes all Deliveries made onto Orders where freight disclosure has been selected. This is highly customisable, exportable and can be submitted to the NSW Government with the rebate application.